Why choose Our SEO Company ? SEO is what we live and breathe at Gorilla Placement. Our SEO company based in Austin and Dallas, Tx is one of the highest rated firms for internet marketing services. Search Engine Optimization can take on a different meaning at different SEO companies. We perform internet marketing as if it was our own business never stopping until the ultimate search placement has been achieved. SEO Friendly Web design or updates may be required in order for us to achieve rankings in search engines that we know will be top in class. Pay Per Click Management is a large part of our process and works hand in hand with our SEO services to bring the most qualified traffic to your companies site. Since the inception of the internet, seo techniques have changed dramatically. We use all of the seo tools available to get your business to the top of Google, Yahoo and Bing. Our organic SEO services also include viral marketing, article submissions, social media optimization, and bookmarking. We are a member of SEMPO and follow all of Google’s webmaster guidelines for SEO. Our customers are top priority and their internet marketing should be second to none from their search engine optimization company. We are uncompromising about search engine optimization as we want all of our clients to dominate in searches for their most relevant keywords. Our SEO experts have been optimizing company websites since 1995. Our web design is a beautiful web 2.0 design that is SEO friendly so that you can get rankings above your competition with design that puts them to shame. Our internet marketing services will give you a stronger presence than your competitors. We leave no stone unturned and the results for your business will be more calls, emails and more revenue. PPC Management works well with SEO to bring the most qualified traffic to your companies website. 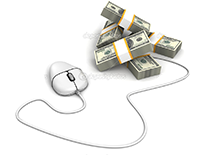 We optimize your ppc campaign so that you get the most traffic for the least expense.